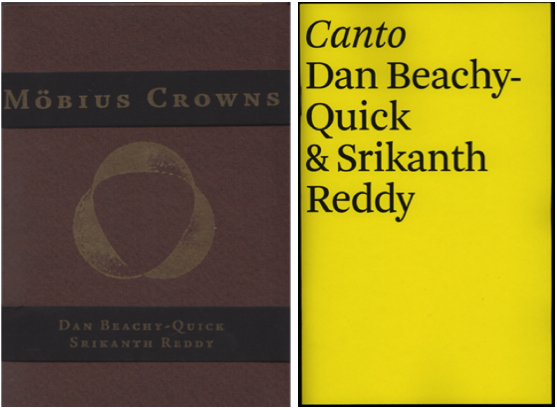 Between 2009 and 2010, poets Srikanth Reddy and Dan Beachy-Quick published two collaborative chapbooks. The first, “Möbius Crowns,” was published by editor and bookmaker Andrew Rippeon for QUEUE books (a chapbook series adjunct to the journal P-QUEUE) out of Buffalo, New York. The second, “Canto,” was the first in The Offending Adam’s chapvelope series, edited by Andrew Wessels, and accompanied by a postcard and a microbroadside.